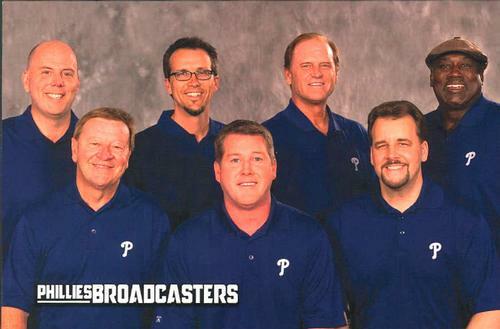 As a new TV contract takes hold for the Phillies, a new broadcast team will be unveiled this season. The Phillies announced that both Chris Wheeler and Gary Matthews will be taken out of the broadcast booth, but will remain with the organization. From the outside looking in, Wheeler caught quite a bit of crap from the average fan (especially on twitter), but was one of the most game-ready broadcasters I’ve ever come across. He was smart, clearly knew the game, and was prepared. Sarge was a pseudo-fan fave, although it was clear the multi-man booth, with interchangeable parts, was not part of the future. There has been no indication of who will take over, but Todd Zolecki of MLB.com says they’ll look for just one person to fill the vacancy. Some names of the cuff: Ricky Bottalico, Doug Glanville, Ben Davis, Dan Plesac, Jeff Brantley. Who would you go with?